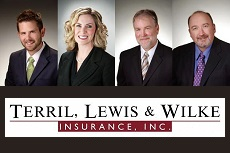 Homeowners, Car & Business Insurance | Terril, Lewis & Wilke Insurance, Inc. Since 1931, the agents and staff at Terril, Lewis, & Wilke Insurance, Inc. in Yakima, WA have dedicated themselves to designing, delivering, and maintaining quality insurance solutions that fit the needs of you, your family, and your business. As an independent agency, we take the time and make the effort to learn your story, allowing for a personalized policy unmatched in the area. Through a catalog of top-tier carriers, we craft the insurance coverage that will keep you fully covered at an affordable price. From the most general personal insurance line to a larger enterprise account, we are there for you. Individuals and families seeking home, auto, and health insurance policies can find the professional services they need, while experiencing the small-business feel of an independent agency. Working with an agent at Terril, Lewis & Wilke Insurance, Inc. means that you will have access to insurance coverage that's specific to you, rather than the big-box insurance that can leave you susceptible to unique risks. From generalized commercial insurance policies to surety bonds and more, Terril, Lewis & Wilke Insurance, Inc. has a history of professionalism and relability when it comes to securing our local business owners. Farmers can also find the coverages they need, whether it be a general farm insurance policy or you occupy more specific niches, like winery insurance. Your greatest assets will be personally attended to on a regular basis by an insurance agent invested in your livelihood just as much as you are. Getting Started with Terril, Lewis & Wilke Insurance, Inc.
We look forward to getting to know you and learning which insurance strategies will fully cover you while keeping costs low. With a diverse lineup of carriers, we will identify which best suit your needs and design a policy for you. Your account is monitored regularly so that we can identify opportunities to update your policy in order to strengthen coverage and potentially save you money. Clear communication channels are the foundation of our business, allowing you to fully understand your insurance and get in touch with your agent when you need to most. To learn more, give the team at Terril, Lewis & Wilke Insurance, Inc. a call at 800-244-2615 or contact us online. If you're interested in getting started, request a quote today to supply the information we can use to begin outlining your coverage.